Continuing on with the Herman Miller surfboard table concept, we decided to make a new modern version with a twist. 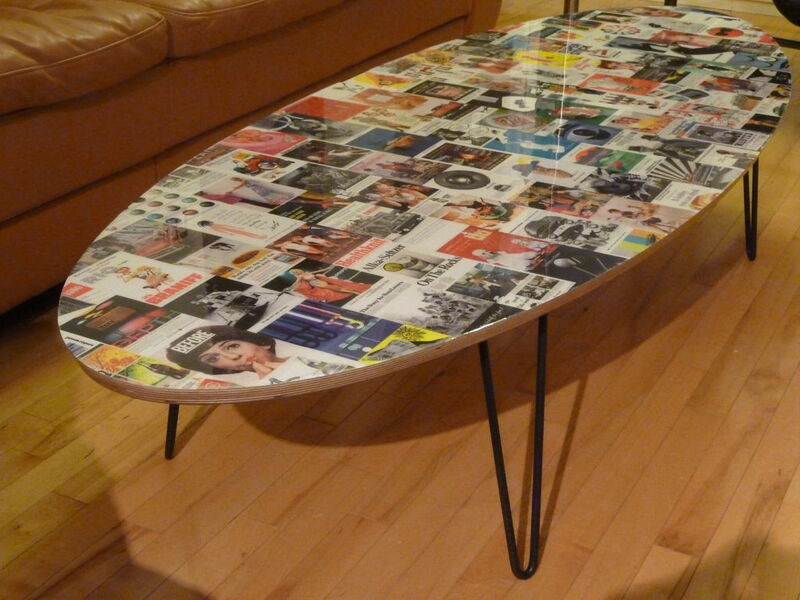 Using ads from a calendar, they were decoupaged onto the plywood and then later covered in epoxy resin. Baltic birch is used for its stability - it's comprised of 13 layers. First we needed to select which ads we wanted for the table. We chose a mix of famous brands as well as cool/funny ones. We also needed to figure out the layout of the ads - random, straight lines vertically,horizontally, or offset. After establishing a horizontal reference line for the ads to follow - we decoupaged each ad into place. We used 3 tops coats - and found the usual issues of wrinkling. We found that putting a plastic bag down over the semi-dry ad, then running the laminate roller over it worked the best. We have found that heating the epoxy in hot water before mixing breaks down the viscosity and makes for a better and much easier pour. We cut and glued laminate onto the underside of the table to add stability. To prevent warping of the wood, you must balance it out. Spread glue onto table bottom and laminate. Let it 'tack' (~15-20 minutes). Lay out wood dowels onto the table. Placed the laminate onto the dowels, then removed one at a time (from the center outward) while pressing the laminate into the glue. Once all dowels were removed, we took a laminate roller and pressed out the bubbles. Once dry, I put the template onto the table and used the router to get the finished edge shown. I like that dog and cat diary.....funny. Ok, I have update it with more pics. Send me a private message if you need more info. 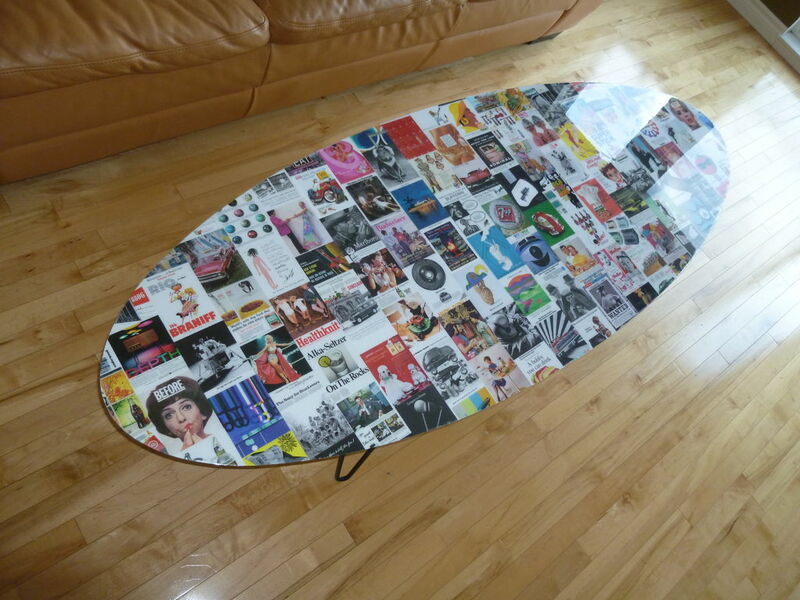 Check out my other Instructables of different tables I made. One question... how did you contain the epoxy from going over the edges? Did you have to build something for that - or did it drip and you sanded? I built a dam around it - you can use duct tape or Frog tape (painters tape). It is too difficult to sand, and very hard if not impossible to get out once it soaks in. OR you can let it flow over the edge and wipe the drips from the sides+bottom every 15min. or so, just after you pour the epoxy. This way, it reduces the amount of sanding and/or damage to the bottom. Put painters tape around the bottom surface as well. it's beautiful! I just wish you had put more step by step pics in!! I'd like to try to make it someday but don't want to mess things up!! This whole process is new to me. I shortened the write up because I felt maybe it was a bit long and people would lose interest. its so cool, i like it. worth thousands of votes. where do you get the vintage photos? Thanks. It was a calendar bought from a bookstore. The link to the company is shown below. We had to cut the dates of each and every one of those pics - very tedious.